Anxiety: a feeling of worry, nervousness, or unease, typically about an imminent event or something with an uncertain outcome; excessive uneasiness and apprehension, may be accompanied by compulsive behavior or panic attacks. 1. Take a deep breath and recognize where the anxiety is coming from. We can’t face or deal with our anxiety if we don’t know where it’s coming from. Stop and take deep breaths to calm yourself down so you can locate the anxiety. 2. Release the tension from your body. Without releasing tension, you’re prone to continue thinking in anxious terms because your body is sending you signals that you need to be fearful of something. Utilize progressive muscle relaxation to let go of this tension. 3. Use gratitude to overcome your anxiety. 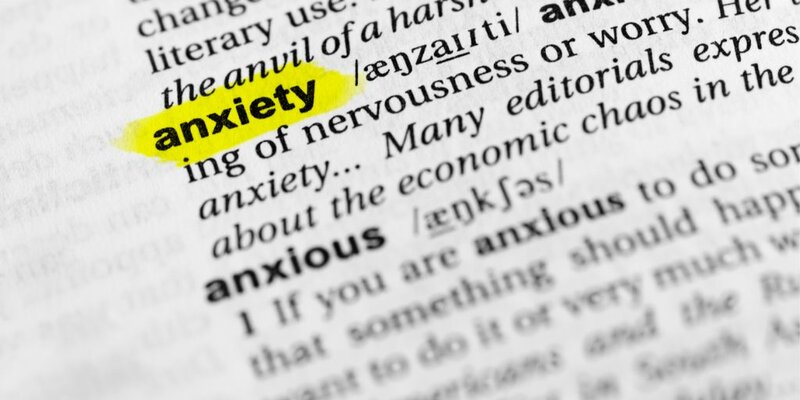 Anxiety is not always negative, but it can become overwhelming if we continue to dwell on it. Thank your anxious thoughts for brining concerns to the forefront of your mind and keep it moving. Let your mind know that you have considered these thoughts, thank them, and remind yourself that you can handle it. 4. Move away from self-destructive beliefs and use positive self-talk. Be your own best cheerleader! Remind yourself that you are strong and capable of facing your anxiety. If you continue to fall into the same negative pattern of thinking, your anxiety will begin to consume your brain. Our brains are like quicksand for negative thinking patters; it soaks it all in, while it acts like Teflon when we have positive thoughts, they bounce right off. Practice, practice, practice your own motto! 5. Recognize the difference between rational and irrational thoughts. Question the thoughts you’re having and ask yourself if they are as real as you believe them to be. Is there evidence? Challenge them! 6. Accept your anxiety. Pretending it isn’t there or ignoring it may make it worse. If you’re going to overcome it, accepting it is the first step. Anxiety is not intolerable, it is just a feeling and feelings are okay. You may not like it, but it is there. 7. Visualize yourself facing your fears and getting through the anxious event, moment, etc. Believing that we can get through the moment and using visualization will help you focus on what needs to get done rather than giving into the fear. 8. Give up control. Often times, we worry about things we cannot control. Recognizing and accepting that some things are beyond our control can reduce anxiety because this is reality. Ask yourself, can I control this situation? If not, our worry isn’t helping. 9. Get thoughts out of your head and down on paper! Identifying your anxieties on paper helps your not only sort through them and make sense of them, but also provides relief to your mind. Using thought logs and journals can help reduce automatic response and thoughts to anxiety provoking situations. 10. Take care of yourself! Setting up a good routine for yourself can help ward of unwanted anxiety. Get enough sleep, keep a healthy diet, and exercise!